Why has it taken me this long to blog the recipe? Inevitably I cook and bake a lot more than I ever have time to put up on the blog and sometimes a bit of a queue builds up. Many of the recipes I intend to publish and take photos of never make it to the blog at all. On occasion, I may have lost some of the scribbled notes I make when creating the recipes or I never wrote anything down at all – yikes! Why Make One When You Can Make Two? Luckily, this isn’t one of them. It may have taken a while, but this double delight bundt cake with chocolate rum & raisin and coconut & lime is too good to miss. Both the chocolate rum & raisin batter and the coconut & lime make excellent cakes in their own right, but baking them together in this way doubles the delight. The flavours marry well and the different colour batters provide a good contrast. Over the years, I’ve found a mixture that works brilliantly for my bundt cakes and all I need to do is play around with it a little to alter flavours and textures. Then it’s just a case of finishing it off with a drizzle of icing, sauce or chocolate ganache. This double delight bundt cake with chocolate rum & raisin and coconut & lime is pretty easy to put together. It’s a simple process of creaming the butter and sugar, beating in the eggs, then stirring in the flour and other ingredients. I keep a jar of rum soaked raisins ready for all eventualities, so for me it was just a case of digging out a couple of spoonfuls. If you don’t happen to have one of your own (though I strongly recommend it), just soak some raisins in rum an hour before making the cake. You can make most of the cake batter in one bowl. Then it’s just a case of dividing the mixture in two. Add ground almonds, cocoa and rum soaked raisins to one half and desiccated coconut, lime zest & juice to the other half. Add a spoonful of one to the bundt pan, then a spoonful of the other and so on until all of the mixtures are used up. Bake the cake, add a drizzle of lime icing over the top and hey presto, you have a scrumptious cake fit for Sunday afternoon tea, a birthday or entertaining guests. Annoyingly, in the general excitement of cutting into the cake, I didn’t manage to take any photographs of the inside. If you want an idea though, it looked, something like this chocolate orange bundt cake. See the photo above. A deliciously moist swirl cake where you get double the delight with two cakes in one. A chocolate cake with rum soaked raisins and a coconut and lime cake. Drizzled with a little lime icing for a finishing touch. Easy to put together, but makes quite an impression. Beat in the eggs, one at a time, alternating with a spoonful of the flour if necessary. Sift in the flour, baking powder and bicarb. Stir until just combined. Place half the mixture in a separate bowl. To one bowl, grate in the lime zest and ½ of the lime juice. Add the desiccated coconut and stir until just combined. Add the cocoa powder, ground almonds and rum-soaked raisins to the other bowl and stir until just combined. Spoon heaps of alternating batter into a greased silicone bundt mould or tin. Bake at 180°C for about 40 minutes or until the cake is well risen and an inserted skewer comes out clean. Allow to cool for 10 minutes, then turn out onto a wire rack to cool completely. Mix the icing sugar with just enough of the remaining lime juice to make a slightly runny icing. Spoon over the cooled cake, allowing it to drizzle down the sides. If soaking the raisins specifically for the cake, add any rum that hasn't been taken up by the raisins. This double delight bundt cake with chocolate rum & raisin and coconut & lime is my entry to this month’s #WeShouldCocoa. I’m also sharing this double delight bundt cake with the following linkies: Baking Crumbs, normally hosted by Only Crumbs Remain, but this month by Jo’s Kitchen Larder; Bake of the Week with Casa Costello; Love Cake with JibberJabberUK and #CookBlogShare at Everyday Healthy Recipes. Double Delight Bundt Cake. PIN IT. Can u use plain flour ? Hi Natalie. I’ve tried it with half plain and half wholemeal in the past, but never used all plain flour. I expect it would work, though the texture will be different. This looks so pretty. Love the flavour combinations, makes me want to whip out my bundt tin! Whip it out Amy, do. They inevitably look good and you get a more even bake too. 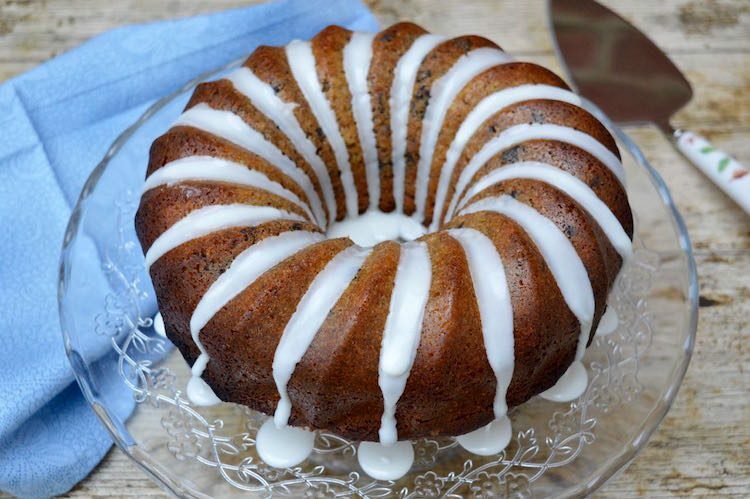 This bundt cake is definitely a stunner, Choclette. Perfectly tender and moist crumb that I really adore. Thanks Angie. It’s the inclusion of ground almonds that does it I reckon. Fantastic flavour combinations! Looks marvellous too. I know exactly what you mean by taking more photos than being able to blog. Pinned to my Bundt cakes board. Thanks Galina. I seem to have either the scribbled notes and no photos or the other way around. It’s such a relief when I have both. What a delicious mix of flavours! I could certainly do with a slice right now! Thanks also for including my orange bundt cake! Doing it this way does mean you never get bored of your slice of cake – as if! your cake looks so striking ! It really stands out and I also love the flavours you have incorporated. Thanks Jenny. Bundt cakes are just brilliant for an easy wow factor. Thanks Jo. I’ve never trusted tins for this sort of cake as there are so many fiddly bits that are bound to get stuck, but I’ve been really happy with my silicone mould. Thanks Monika. Wholemeal flour has had a bad press over the years, but I’ve always baked with it and it’s fabulous. Thanks Kirsty. Both flavours would have been good on their own, but sometimes it’s nice to change things up a bit. thanks for sharing,this recipe is simply out of this world. Thanks Dannie. It’s not too bad at all. What a couple of wonderful combinations. I love that you have a jar of raisins soaking in rum for such occasions. Your kitchen cupboards must be filled with delicious treats. Well, I’d love for that to be the case, but I’m not as organised as I’d like to be. But a jar of rum soaked raisins are a must.